Here we are. Vacation over. Wine to be bottled after six months of aging in barrels. Vanilla excessive. Solution. I blended 10 liters of the same wine that, in the same period, aged in glass containers. The hope is that the notes yielded by the French oak will become a perfect frame to the perfumes of the Cesanese. To not overlook, with this method, that the bottles produced are now doubled and will rest until Christmas. In the meantime, I will ponder the label. I forgot to mention, the bottles have already been corked using a high-tech gizmo – an electric hair dryer. Leaving Eastern Oregon behind, I headed northeast across the border into Washington State and the Tri Cities…..Kennewick, Richland and Pasco. My meeting with Gilles Nicault, of Long Shadows Winery, was the next morning so I decided not to take any chances and head for a large campground, Hood Park, at the confluence of the Snake and Columbia Rivers. A small snag….. all the spaces were reserved. Again? However, I could camp in the overflow area if I’d like, and have access to amenities. One lone tree in the overflow, and I set up camp beneath it. After all, still summer….and still hot. No one else was relegated to the overflow field (erm…campground) that night, so a bit of “aloneness” was felt. Mace at hand always makes me feel a bit more secure. Perhaps false security, but it allowed me sleep. 20,000 years ago by the Great Missoula Floods. The varying elevations allow for unique micro climates within the vineyard, producing 15 different grape varieties. At the higher elevations are the cooler white varieties like Riesling, Chardonnay and Pinto Gris. On the middle benches are the warmer climate grapes like Merlot, Petit Verdot and Cabernet Franc. At the lowest and hottest elevations are Cabernet Sauvignon, Syrah, Grenache and Malbec. Only Mr. Shoup, with his reputation in the wine world, could attempt and succeed at a project of this magnitude. The collaboration with a respected winemaker in his own right, Gilles Nicault, is a match made in heaven. Salute, Long Shadows! Who knew Sisters, Oregon was so charming? Apparently, not me. Sisters was not my destination, but I landed there anyway. Finding Bend’s Tumola Campground packed, a ranger was kind enough to walk back into her already closed station and give me the number of a KOA nearby that might take tent camping. A quick call to the KOA found they were also full. The sweet man who answered recommended I travel another 10 miles up the road to Sisters’ City Park, where I would find a “pretty little park where you can walk to breakfast in the morning.” My hesitation at a “city park” was noted, but he guaranteed I would like it. Finding the park, I had to admit he was right. It was clean, with showers, camp host and a nice group of people vacationing. The campsites were a little close together, but I was thrilled to find such a cute park. After setting up camp…literally…I walked downtown to browse. As the sun was setting, stores were closing. Luchese boots, and Baggialeri travel bags in shop windows were indications that this was not the central Oregon town I had envisioned. Bakeries with homemade pies, western-themed art galleries, bicycle shops, restaurants, and two wine bars gave this little town a charm all its own. adventurers, retirees, and the occasional real cowboy. Okay, rancher. He was decked out in all the traditional gear but with a decidedly upscale look. From Bend to Sisters the landscape is dotted with horse ranches and equestrian centers, all nestled in Ponderosa Pine. Driving past high desert meadows with a view of the Sisters mountains was a different type of beauty from the North Umpqua river I’d just left. Steeped in this new territory, I felt certain the Ponderosa would appear on the horizon……offering up an elegant dinner prepared by the Cartwright’s beloved cook. Sisters is an understated jewel, smack in the middle of fabulous biking, hiking, golfing and is an outdoor enthusiast’s nirvana. The town is a cross between Sedona, and Jackson Hole…with the downtown prettier than I remember either of the aforementioned. A western-themed town, but somehow less commercial. More pristine. The question: With a relatively open August schedule, and some much needed time away from a computer….what could my home state of Oregon provide in the way of adventure? Plenty. With an interview scheduled in Walla Walla, Washington for mid-August, why not do a road trip through central Oregon and then north to Walla Walla? Better yet, why not camp my way through? I’d always wanted to camp on my beloved North Umpqua river, but never seemed to have the time. So with a tent, air mattress, folding chair and lantern, it was time to uncover more of this state…up close and personal. I chose Susan Creek Park on the N. Umpqua as it had all the amenities that a girl could want. (showers, flush toilets, camp host)While longing for a quieter campsite, noise is something to give up for safety. Nice to have camp hosts around, and lots of campers. With a Rottweiler, a secluded campsite would have been chosen. But I got lucky and my campsite neighbor, Ernie, from Bend, Oregon was a sweetheart. For the past 15 years, he has been fly-fishing on the N. Umpqua and had met the same people there year after year. Bonds were formed, and they see each other at least once a year. Dora, the cutest long-haired Dachshund I’ve ever seen, gave Ernie’s campsite that “professional fly-fisherman/sweet, caring guy” vibe. Walking down to the camp bulletin board to make the “hefty” payment of $14.00, a gentleman commented on the U.C. Davis football shirt I was wearing. It was his alma mater, and he was there with his family from Sacramento. (We probably live a half hour away from each other) A cardiologist, he and his family have also been coming to the N. Umpqua river for over 15 years to fly-fish and soak up nature. After meeting his beautiful wife and daughter later that day, an invitation was extended to join them for Umpqua Dairy Blackberry Ice Cream after dinner. They had stocked up on it when driving through Roseburg. Smart. Great family, ice cream sitting around the campfire….buona fortuna. The next day a woman drives into the vacant campsite across from me. She is hauling one of those cool pop-up campers, and deftly backs it into the campsite. With two young girls jumping out of the SUV, I mentally sent kudos her way for her tenacity. Kari is from southern California and is taking a two week camping trip with her kids, with the N. Umpqua being the furthest destination north. (Her husband has been able to fly in twice along the excursion to see them) While getting acquainted in front of our campsites, there is a noise coming from the SUV. “Oh, that’s my son waking up!” What? Three kids? Her son, affectionately named “Bam-Bam” after the Flinstone’s cartoon character, kept us entertained. Kari is a sweet, charming woman, and she IS mother of the year. I met some amazing people, and count myself lucky. Exactly what happens when you travel. What about the wine? Oh yes, that would be the Umpqua Valley AVA surrounding the town of Roseburg. They say it’s the next Napa Valley. As usual, we make our first maturity control on August 10th and this year was not different. This first contact with the new grapes reveals a first rough idea of when we will start harvesting this year. Some of you may have heard that the very warm Spring of 2011 culminated in an early fruit setting and quick maturity during the first weeks. In some regions of Spain and France, producers plan to start harvesting in the end of August, beginning of September, 2 weeks earlier than normal. Also in Portugal the maturity is ahead of the traditional schedule. 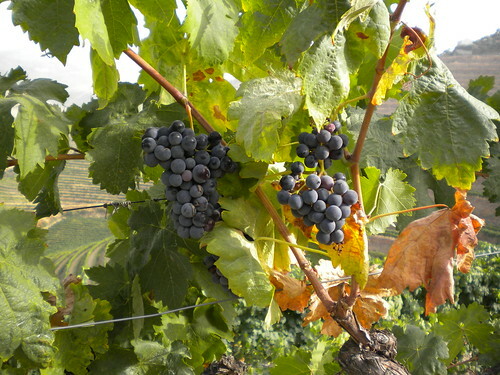 In Alentejo, the south of Portugal, there are grape producers already harvesting. For us it is still too early to start harvesting. First, because this first control showed that we are still around one month ahead of a full and complete maturity. And second, because grapes for Port Wine normally are harvested slightly over ripened, to achieve flavors of prunes, figs or blackberries. If you read our previous post about the mildew on the vineyards, you may be wondering whether this constraint will affect the production. Indeed, it will be necessary to take extra attention to the grapes that are collected. There are still some dry bunches on the vines together with ripe and healthy ones that are in good conditions. But these dry ones must be avoided, removed and left on the ground. Otherwise, they would give a vegetal, woody flavor to the wine that we don’t want at all. In some bunches, the top is fresh and good while the bottom is dry and bad. So an even more careful selection of the grapes collected is going to be necessary. As usual, I welcome very much your questions and comments! The turnout has been constant for the past year to the point of not being particularly reliable. In any case, I don’t have a particular problem being objective. As far as I’m concerned, the reason Paolo and I became friends is because of my fondness for the wines of Carpasa. I would add that the fact of the simplicity, the humanity, and passion are qualities that one has or has not; when one fakes it it’s easy to detect. To visit the Carpisino vineyard for me was like taking a step back decades in time. You arrive in a softened environment where signs of modernity end on the second floor. You are enchanted by the greens, the yellows, and the various shades of browns. The farm is surrounded by the grapevines, harvest management, and the family administration. All are concentrated on the production of wines made from a variety of terrain: sangiovese, canaiolo, colorino, trebbiano, and malvasia. With the only intrusion of the “angellotta”, not exactly an international vintage, almost a simple natural “coloring.” The most reliable guarantee of the soundness of the product is that Paolo drinks his wine…. during the wine tasting, with visiting groups who come by to visit, assessing the product from the barrels and vats, as well as from the bottles of wine, uncorked for meals. In this, Paolo is the antithesis of the producer that puts sales above everything else. The wine has to be good and wholesome because it is part of his life. Work and life intercede totally, resulting in sacrificing time away from his sizeable family. Gianna patiently rolls her eyes to the sky. Five children are not an easy task, the older ones give a hand when they can, but the little ones are quite an undertaking. Between the store, the wine cellar, vineyard, bureaucracy, and family, there is no rest in Paolo’s life. It’s a pleasurable, constant undertaking. Certainly, an occasional curse slips in…….but the sweet and serene pride of this amusing, bespectacled and sharp artisan, always available for a discussion, confrontation and willing to listen. He’s also available on-line where Paolo dives in, on those rare moments when he takes a break from physical labor. We’re happy to introduce Oscar Quevedo of Quevedo Port Wine as our first wine blogger from Portugal! We met Oscar at the European Wine Bloggers Conference last year in Vienna, Austria. Oscar is one of those guys you can’t forget…..friendly, outgoing and passionate about winemaking. We look forward to articles from the heart of the Douro Valley, with the insight and experience that Oscar provides….in both English and Portugese. Welcome, and cheers! We’re happy to have EnoClub Siena as a guest contributor for their commentary and expertise on wine from the Tuscany region. EnoClub Siena was formed in 2010 as a private, non-profit voluntary organization. Members come from all walks of life, but are united by a passion for wine. Their goal is to promote and further the culture of wine and wine appreciation, most notably Chianti Classico and Brunello. Their insight into this beautiful and historic region is a gift, and we are fortunate to have them on board. Welcome, and cheers! This is a question that some of our readers ask me, and instead of replying on an email, I will make my suggestions here. If you only have one day to visit the region, make sure you go to the Douro as early as possible. A car will help you moving around, because one of the things that is hard to find in the Douro is public transportation. However, there is a train line that connects the Douro and Porto. The first train from Porto – Campanhã to Régua leaves Porto at 6.35am and gets to Régua at 8.52am. In total, you have 13 daily connections between Porto and Régua during a week-day and 12 on the weekend. If you plan to go further east to Pinhão or Ferradosa, the first train from Porto is at 7.25am, arriving in Pinhão at 9.41am and in Ferradosa at 10.13am. To go back to Porto from Ferradosa, the last train is at 5.55pm and from Pinhão at 6.30pm, arriving in Porto Campanhã at 11.10pm. Trains’ timetables change often, not always for better, so please check CP – Comboios de Portugal site before starting your journey. If you are traveling by train, you better schedule visits to wineries in advance and ask winemakers to pick you up, if they can. Otherwise, you will have to take a taxi. By bus, you can go from Régua to Lamego, from Régua to Pinhão and to S. João da Pesqueira, but there are very few buses that run everyday. If you are in Régua, you must go to the Douro Museum. It is a very nice place where you can better understand the history of the region and its people. Take a look as well at the Casa do Douro building, which was once a very important organization in the regulation of Port Wine industry. Rota do Vinho do Porto may help you find wineries that are open to receive you. Further East there is the small village of Pinhão. Due to its location, on the north bank of the Douro river, at the mouth of the Pinhão river, it has a very beautiful landscape, with plenty of Quintas to visit. You will find several famous wineries, but don’t forget to contact those you want to visit in advance to ensure that they’re ready to receive you. In Pinhão, right in front of the train station, you will find one of the nicest hotels in the Douro, The Vintage House. If going to Ferradosa, located slightly farther east and nestled at the beginning of the sub-region of Douro Superior, you will also need to schedule your trip in advance. In Ferradosa there is no buildings or houses, but a very small train station, a nice restaurant located 10 minutes from the station and the most beautiful landscape in the Douro valley. It is a great place to see, but there are no taxis or buses at the station, and public transportation is poor to say the least. Again, call taxi or wineries prior to your visit so that they may pick you up. Ferradosa train station serves S. João da Pesqueira, the town where our winery and the most of our vineyards are located. Maybe because I’m from here, I consider this area to be one of the most stunning views in the Douro. That being said, you’re always invited to come check it out yourself! There are plenty of other places you can visit, such as: São Salvador do Mundo, São Leonardo da Galafura or the city of Lamego, but to avoid making this post too large, leave your comments and I will try to help you organizing your trip to the Douro valley. La frequentazione è stata talmente assidua da un anno a questa parte al punto da temere di non essere particolarmente attendibile. Del resto, non mi pongo particolari problemi di obbiettività, a me i vini di Caparsa piacciono e il motivo per cui siamo diventati amici con Paolo è proprio quello. Aggiungo poi il fatto che la semplicità, l’umanità e la passione sono qualità che si hanno o non si hanno: quando uno finge lo si vede bene. Frequentare podere Caparsino per me è stato come fare un salto indietro nel tempo, di decenni. Si arriva in un ambiente ovattato, dove i segni di modernità finiscono in secondo piano. Si resta ammaliati dai verdi, dai gialli, dalle varie tonalità brune. Il podere circondato dalle viti, gestione raccolta, concentrata, familiare, tutta puntata sulla produzione dei vini, fatto con varietali di territorio: sangiovese, canaiolo, colorino, trebbiano, malvasia. Con l’unica intrusione dell’ancellotta, non esattamente un vitigno internazione, quasi un semplice “colorante” naturale. La migliore garanzia della sanità del prodotto è che Paolo beve il suo vino quotidianamente, in quantità: durante gli assaggi con i gruppi di visitatori che passano a trovarlo, nelle valutazioni dalla vasca, dalle botti. E nelle bottiglie stappate per i pasti. Già in questo Paolo è l’antitesi del produttore che pone la vendita sopra a tutto il resto. Il vino deve essere buono e sano perchè accompagna tutta la sua vita, lavoro e vita si intrecciano in maniera totale, finendo per sacrificare momenti alla numerosa famiglia. Gianna alza gli occhi al cielo paziente, cinque figli non sono uno scherzo, i grandi danno una mano quando possono ma i piccoli sono un bell’impegno. Tra negozio, cantina, ,vigna, burocrazia, famiglia, la vita di Paolo non ha mai momenti di pausa. E’ un piacevole impegno costante. Certo, ogni tanto qualche imprecazione scappa, ma la fierezza dolce e serena di questo buffo artigiano, occhialuto e svelto, lo rendono sempre disponibile al dialogo, al confronto, all’ascolto. Anche in rete, dove Paolo si tuffa, nei rari momenti in cui si concede una pausa dal lavoro fisico. Appena incrociato, tra i banchi lungo la via centrale del paese, durante un inizio giugno da Radda nel Bicchiere, riparato dietro alla sua inseparabile verticale di Doccio a Matteo, ho capito che non potevamo pensarla in maniera molto diversa sul vino, forse anche sulla vita. Mentre gli altri presentavano una sola annata, lui ne presentava sette, sette annate!